Have you ever wondered what it would be like to own a pizzeria? 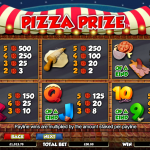 Well now you can join our main character in Pizza Prize a video slot game from NextGen Gaming. Let’s see if you can make the perfect pepperoni pizza and if you do Tony will reward you really good. It seems that the pizzeria is placed in a really nice neighborhood so you would definitely want to visit it. Tony is the wild in this game and it will stand in for every other symbol to complete a winning line. The only symbol it cannot substitute is the square pizza which is the scatter in this game. But that is okay since we need this symbol to trigger the free spins round. You need to land 3 or more scatter symbols anywhere on the reels to receive 15 free spins with doubled wins. But that is not all, additionally a pizza oven will appear above the reels and it will award you the following if a pizza symbol lands on that particular reel. 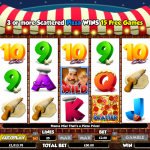 On the first reel pizza will turn wild, on the second reel you receive a multiplier between x2 and x5, on the third reel the pizza will become wild, or all the symbols will turn wild, on the fourth reel your multiplier can increase up to x8 and on the fifth reel you will receive between 1 and 4 free spins. 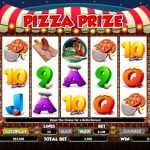 Pizza Prize is a video slot game that offers lots of wins. NextGen Gaming did an amazing job when they created this game that is still played and attracts new players as well. The game play is smooth and the feature can be quite rewarding especially with all those extra features within. For another great engaging game you should consider playing Pandamania a 5 reel slot by NextGen.